Super creamy and dairy-free, too. 1. Heat the sugar in a small pan with 4 tbsp water, stirring over a medium heat until dissolved and you have a thick syrup. Mix the coconut milk and cream in a large jug with a large pinch of salt, then whisk in the warm sugar syrup and add the rum (if using). Cover with cling film and chill until cold – about 1-2 hours. 2. Either churn in an ice-cream maker according to manufacturer’s instructions or pour into a shallow plastic or metal container and freeze for 1 hour, then whisk thoroughly to break up any ice crystals. Repeat once more, then, for the third and final time, blend in a food processor until combined and return to the freezer for at least 4 hours. 3. Put the ice cream in the fridge 5 minutes before serving, to soften slightly. 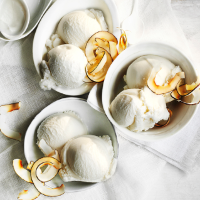 Use a warm ice cream scoop to serve, with homemade coconut flakes alongside, if liked. Preheat the oven to 200 ̊C, gas mark 6. Hold a coconut over a bowl with one hand and, using a knife sharpening steel (or the back of a heavy knife), tap sharply around the equator, turning the coconut as you go, until it splits in half. Grip the cut-side of the coconut and tap the rounded edge of the shell, rotating until it cracks and breaks off in places. Remove the shell, using a table knife to help, if needed; repeat with the other half, discarding the shell. Rinse the flesh, then slice it as thinly as you can (use a mandoline, if possible). Spread over a large, parchment-lined baking tray and roast for 8-10 minutes, turning halfway, until lightly golden and crisp.